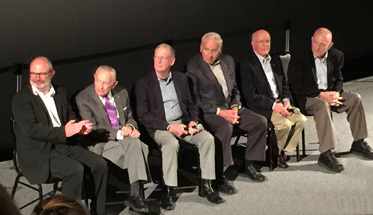 I saw the premier of Mission Control: The Unsung Heroes of Apollo at Space Center Houston on April 11. The documentary tells the story of the Apollo years (1967-72) through the eyes of the flight controllers in Houston’s historic Mission Control. Based on the book, Go Flight! by Rick Houston and former Flight Director Milt Heflin, the movie consists of interviews with flight directors, controllers, and astronauts interspersed with audio and video footage from the Apollo missions. Chief among those interviewed was the man who invented Mission Control and whose name adorns the side of the building where it is housed: 92-year-old Dr. Christopher C. Kraft, Jr.
L to R: Movie Director David Fairhead, and Apollo Flight Directors Chris Kraft, Jr., Glynn Lunney, Milt Windler, Gerry Griffin, and Gene Kranz at the premier of Mission Control: The Unsung Heroes of Apollo. Photo by Marianne Dyson at Space Center Houston, 4-11-17. Even though it was fun to see all our “founding fathers” and hear their stories again, and it was nice that McMillan and Flight Director Ginger Kerrick were included in the show, I found myself wishing they’d included some interviews with the women who worked in Mission Control during Apollo. I sat next to one of these trailblazing women, Flora Lowes, who supported the Flight Dynamics Officer during Apollo and the early Space Shuttle Program (as “Nav” for Navigation). I could not find her on the Apollo rosters, perhaps because she was in the Mission Planning and Analysis Directorate (MPAD) versus Flight Operations who published the list. I did find Frances M. “Poppy” Northcutt who worked for TRW as RETRO Support for Apollo 8 (and 10, 11, 12, and 13) and who is generally considered the first female flight controller. These women proved themselves as flight controllers, thus opening the door for more women, like me, to be considered for MOCR positions during the Shuttle era. And like the two young women I met after the show who are in training to be Flight Dynamics Officers (FDO, pronounced “fi-doh”) for Orion. They said their supervisor is a woman, and there are women in their chain of command all the way up to the Center Director Ellen Ochoa. As astronauts continue their explorations in space, and passengers join in the adventure, they can rest easier knowing that a team of bright young people like the new FDOs are in Mission Control watching over them. Thanks to this movie, perhaps some of these “unsung heroes” will finally get the recognition they deserve. 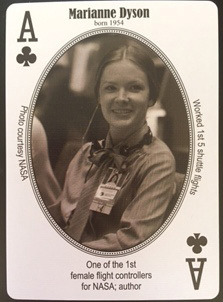 The International Women in Aviation & Space Museum has issued a set of playing cards featuring women in aerospace, and I’m honored to be the Ace of clubs! Decks are only $10, but order cards soon because they only printed 1000 and will sell out quickly! All sales go to support this fine museum in Cleveland, Ohio. 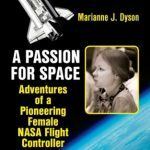 Learn more about what it was like to be one of the first female flight controllers in A Passion for Space: Adventures of a Pioneering Female NASA Flight Controller. Read a science fiction story “Fireworks in Orbit,” based on one of the contingency cases I created as a flight controller. The story was originally published in Analog in 1990, and is reprinted in my collection called Fly Me to the Moon available in print or as an eBook. Watch for three of my articles about future plans for the Moon in the summer issue of Ad Astra magazine published by the National Space Society. I’d love to share space with you! Invite me to speak to your school, conference, or library. I offer short programs and STEM workshops for adults, kids, and mixed audiences. Dyson Author Visits. Saturday, May 6, 10 AM to 4 PM, Workshops for Writers. Morning: Write a Short Story in a Day. Afternoon: How to Publish a Book. Location: Southwestern Presbyterian Church in Bellaire. Cost is $30/$35 for either session or $50/$60 for both for members/nonmembers of Houston Writers House. Saturday, May 13. Comicpalooza at George Brown Convention Center, Houston. Moderating Literary Track panel on Creative Collaborations from 2:30-3:30 & signing books at the Barnes & Noble booth in the exhibit room 4-4:45 PM. Thursday, June 8. All day. STEM activities/demonstrations & book signing. CCISD “Setting the Trend” librarians conference at Victory Lake Intermediate School in League City.